A vacation in South Sulawesi Province is a good idea. Here is one of the best locations to visit. The name is Makale City. This secluded settlement is surrounded by mountains and beautiful nature attractions. Thus, it becomes a good spot for finding peace and getting rid of stresses. In terms of size, Makale is not quite big. It has an easy access to nearby mountains and nature tourism. Due to this reason, many tourists are able to get closer to nature with their families or friends. The primary feature of Makale City is the formation of mountains. They appear beautiful and peaceful. Near to the settlement, several trees grow abundantly. When it comes to the structures, they apply regular shape of Indonesian houses. Many facilities are available including a mosque, markets, recreational places, etc. Another important feature of Makale City is a soldier statue. He carries a javelin. 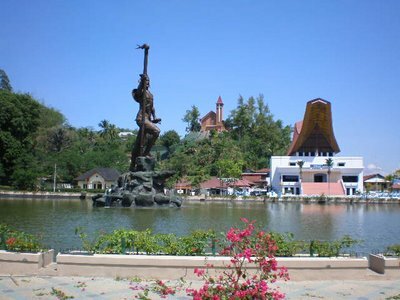 The thing is the statue is situated in the midst of local pool. The pool itself is an icon of the city. The first thing to do in Makale City is to visit the pond. The water is calm and it provides a comfy atmosphere. Usually, visitors spend a few hours sitting and relaxing near to this pond. As mentioned before, there is a unique statue in the middle of the pond. According to the locals, the statue represents a powerful wanderer. He explored numerous locations including the Gowa Kingdom. Later, he married Gowa Queen. The bride name was Tumanurung Bainea. His famous weapon is definitely the spear, which is carried by the statue. For tourists, the statue can be a stunning object for photography. Next, there is Sion Hill. It is also a worthy tourist spot to explore. This location is the home of a beautiful and majestic church called Sion. No wonder, the name derives from it. The best time to visit Makale City is during local festivals and holidays. For instance, it is in the New Year. The locals may gather in one place and perform traditional festivals. Therefore, tourists are able to join this event and spend good times with people of Makale. Another thing to do in Makale City is to explore the traditional market. The location is in the middle of the city. It is considered a crowded market, so you may expect lots of visitors every day. The thing is most of the people in Makale work in this market. Many items are available such as crops, local foods, clothes, and much more. The question is how tourists can reach Makale City. Mostly, visitors come from Makassar City. The distance is 305 km, so it takes about 7 hours. The best route is definitely Poros Barru – Makassar Street. If you use a good vehicle, the trip can be faster and comfortable. For those who come from other provinces, it is better to take an airplane and visit Makassar City first. From there, head to Makale using a taxi or other local transportation services.